Mechanical Bull Atlanta and surrounding area, including all the Souteastern US. Let's Go To The Rodeo! This IS the Mechanical Bull for your event. All the original action and features of the original but in a new, friendlier environment. The RoboBull, covered with real cow hide cover, flexible rubber horns, and a rope grab strap, is mounted much lower than it’s predecessor. To cushion the inevitable fall off is a large soft inflatable air mattress of fire retardant PVC. The unit is competently controlled from the sophisticated control console by our trained operators to ensure your safety and enjoyment. 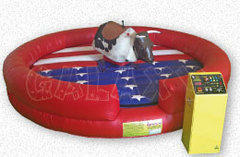 Looking for a portable Mechanical Bulls for Western Cowboy and Cowgirl Themed events? We do that and much more. So grab your Bull riding dudes and plan a western themed party based around out mechanical bull. All our bulls are manufactured by Galaxy Mechanical Bulls, the safest bull around.